Other people can be given Guided tour at the Requesens Palace. Come discover the Requesens Palace, know the history of this great palace and its architecture, built on one of the towers of the Roman wall of Barcelona. We will introduce you to Isabel de Requesens, viceroy of Naples, and how she lived in her time. It is essential to make a reservation beforehand and make the payment. Places are limited. For reservations or any query, you can call 93 327 01 25 (from 9h to 21h from Monday to Friday) or to 697 864 262 (Saturdays from 10h to 14h and incidents). You can enjoy the activity a person other than the one who made the reservation but the amount paid is not returnable. The visit to the Requesens Palace will not be cancelled due to weather. 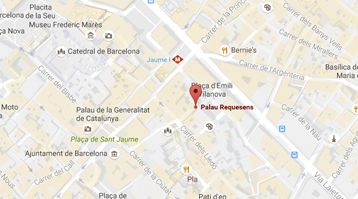 They can give away to other people Guided tours to Palau Requesens. The gifts can choose the day they want to enjoy the experience.